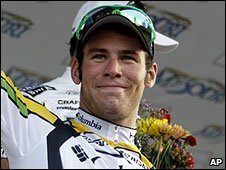 Mark Cavendish withdrew from the Tour of Missouri before the fourth stage of the race because of a lung infection. The 23-year-old Manxman, who was second overall after winning the first two stages, pulled out after an infection spread to his lungs. "Mark has been fighting an infection since travelling to the USA which has spread to his lungs," said a statement from his team Team Columbia HTC. "He's had a long, successful season but his general health must be protected." Cavendish is on a course of antibiotics and will rest in Missouri for a few days before returning to Europe.